Hop on a bike train to work! If you’re looking for a new way to commute, LA Bike Trains has been up and running since May this year. “Conductors” with LA Bike Trains lead weekly rides along eight routes that crisscross Los Angeles County. The conductors keep the ride moving at a moderate pace and help fix any problems that come up, like a flat tire. They also offer a “Special Valet Service” to help you navigate from your home to a bike train meeting point. And unlike a traditional train, rides are free. Bike trains are an easy way to get to work — or to the nearest Metro station. Photo courtesy of LA Bike Trains. Fellow co-founder Bruce Chan and Nona built a network of conductors through their work with the Los Angeles County Bicycle Coalition, Orange 20 Bikes, and other bicycle advocates. “Our conductors are all amazing, dedicated people who have put in a lot of hours from setting up Google Groups and communications protocols, to having ridden their routes over and over again to make sure they can guide people of all abilities,” she said. 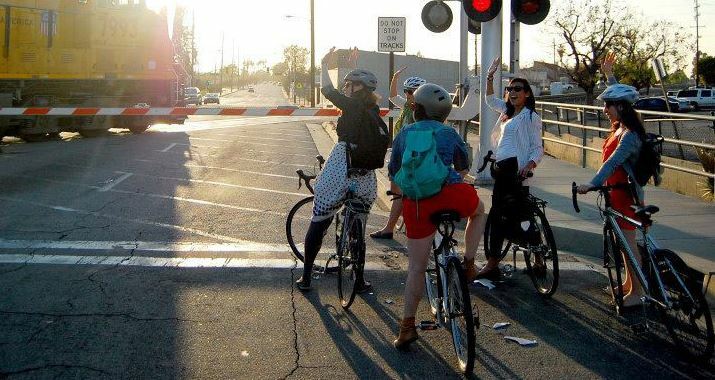 Their vision is to grow LA Bike Trains until anyone “regardless of gender, race, income or neighborhood can comfortably consider an LA Bike Train route an equally viable commuting option to driving, the bus, or the train,” said Nona. For those still on the fence, Nona notes that bicycling is environmentally friendly, healthy, inexpensive, and actually pretty easy — “far more so than dealing with parking.” Touché. To jump on the train nearest you, sign up at LA Bike Trains or take their commuter survey to help them expand service. Similar concept to a “walking school bus” (google it with the quotes). Here is a great video about it in the South Bay.